Arthur Loring, Chris Botti and Vicki Loring. WEST PALM BEACH, FL – They celebrated 20 years of performances with a show of their own. In a gala befitting the venue, original patrons joined with other supporters to celebrate the 20th anniversary of the Raymond F. Kravis Center for the Performing Arts. 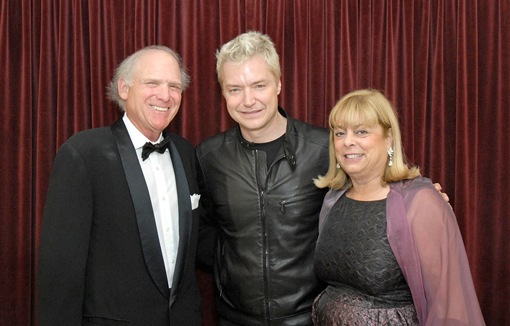 Multi Grammy-award winner Chris Botti was the featured entertainer, and the renowned trumpeter shared in the buoyant spirit of the evening. He invited John Kessler, the performance sponsor, to join him on drums for a closing number, which they built to a vibrant percussive crescendo. 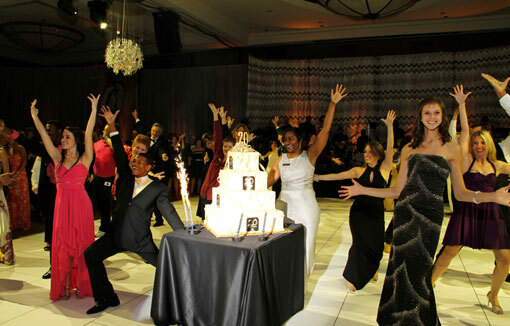 Afterward, guests entered the Gimelstob Ballroom, which was decorated in the style of Old Hollywood, where they were greeted by the DeLaCreme Orchestra. Another treat followed as Kravis Center staffers, from every department, joined with a group of student dancers from several local high schools to perform a “flash mob” dance routine. Rachel Bergner, dance teacher from The Benjamin School, choreographed the rousing performance. The Kravis Center estimates more than 8 million people have attended shows there since its opening, and its budget has increased from $9 million in 1992 to $24 million this year. This year’s Gala chairs included Jeffrey Bateman, Michael J. Bracci, Mark E. Freitas, Christopher E. Havlicek, Harriet Hoffman, Irene Karp, John H. Kessler, Ted Mandes, Jane M. Mitchell, Monika Preston and Kathryn C. Vecellio. Gala performance sponsors were Henni and John Kessler and Vicki and Arthur Loring. Additional sponsors included Helen K. Persson (décor), Kathryn and Leo A. Vecellio (dinner), Julie and Amin Khoury (reception), Sabadell Bank and Trust (theatrical sound and creative lighting), Ingrid and David Kosowsky (dinner dance orchestra), The Breakers (bar and wine service), Stephen L. Brown (public relations), Dorothy and Sidney Kohl (dinner dance show), Jack and Goldie Wolfe Miller Fund (programs and invitations), Jane M. Mitchell (valet services), Laurie S. Silvers and Mitchell Rubenstein (“Rising Stars” table), and Tiffany & Co. for special support. Proceeds from the Gala benefit the Kravis Center’s Annual Operating Campaign that supports its education and outreach activities.